I had a camping trip set up with a couple of buddies this past weekend. We were all set to go and then one of the buddies was told he had to work late which ended the hopes of a camping trip. I felt pretty down about that considering we were supposed to head to Lake Camanche and try our hand at some trout, bass and catfish. 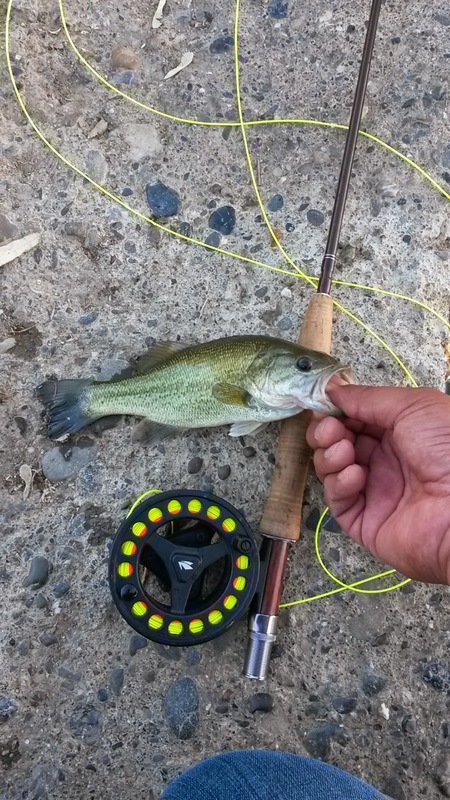 I was especially looking forward to trying to catch some Largemouth bass on the fly rod. But alas, it didn’t happen. 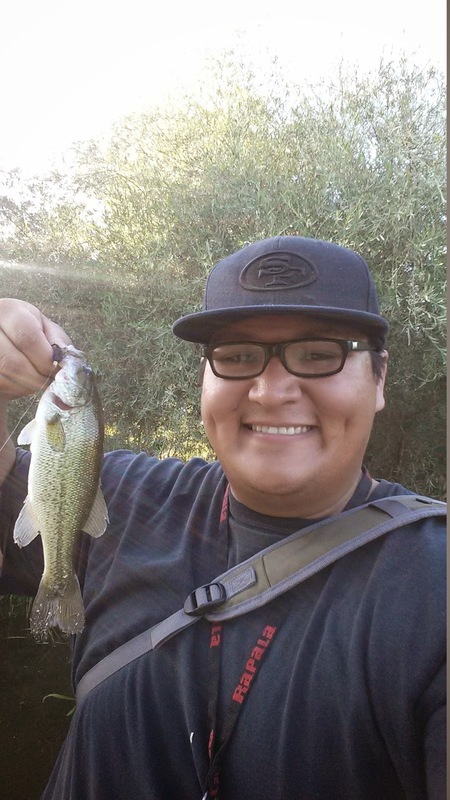 We were supposed to head out later in the day on Saturday, around 4 so I waited until 4, got the news that we weren’t going, grabbed excalibur and then went to the fishing hole. For that day, the fishing hole was Putah creek Central as I will call it because there are three different areas of putah that I fish; West putah (tail water of Berryessa all the way to Lake Solano) Central putah (Davis city limits) and East Putah which is located in the Davis Wildlife area and is headed to the Delta). I arrived at Putah at around 5:00. I hit spot #1 and tied on old faithful (or fairly new faithful) the royal humpy in an orange color. I tossed a few with no bites. It was also fairly tight casting so I moved on after a while. Then I went to spot #2, where I have seen a lot of bluegills in the past as well as some pikeminnows and largemouths. I cast a few and could see the panfish coming up, checking the RH out and swimming away. For whatever reason they did not enjoy the humpy. I went a few feet down and the same thing happened. The last spot was a spot on a little dam or concrete barrier thing that funnels the water on that spot of the creek. The funny thing about this spot on the creek is that I have fished it before and didn’t catch anything. I fished it with a black wooley in the past but had no luck. This time I tried the RH but no fish were interested. After a while I looked at it and just pictured that if any bass were there, they were waiting for an easy meal outside of the swift current. I thought the bass might enjoy a streamer but when I went into my fly box my eye landed on a bead headed black wooley bugger. I don’t know why, it just made sense. So even though I had fished WB’s here in this exact spot before and caught nothing, I went for it. A few feet away from me there was a snag that made me think I had caught a fish a couple of times. At about the 10th cast I stripped my line and thought I had a snag, but then it moved! 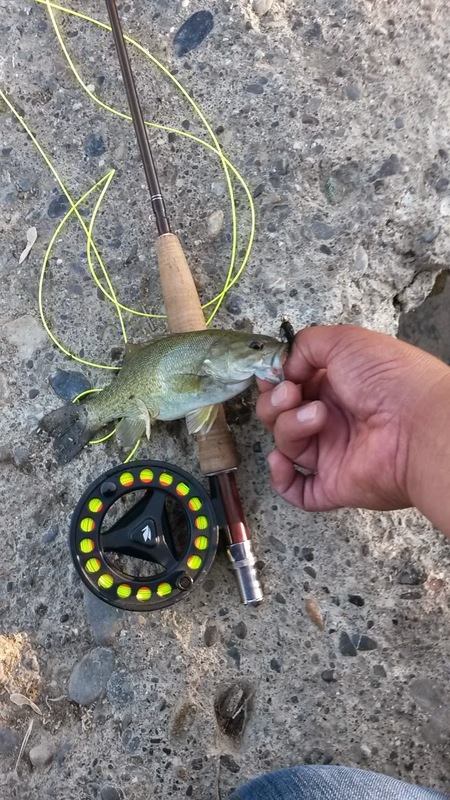 I pulled in a little smallmouth bass which I had never caught at this creek before. Unfortunately I didn’t get any pictures of this fishing spot but its and interesting one. Its about 2 feet across at the spot where I was standing and casting and maybe about 2.5 feet across as it gets closer to shore. Fun little place to fish but you lose your balance at all and you’re wet! About 4 casts later I felt another tug and I got down on one knee to pull this fish in. I could tell it was a little bit bigger and had more fight. 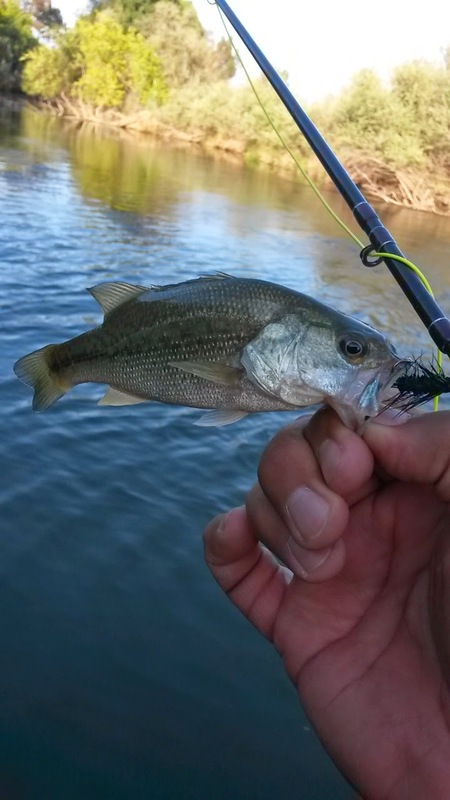 When I finally got him in, I realized that this sucker was a largemouth bass! I was very excited about this milestone which wasn’t big but enough to scratch the Largemouth off of my list. A few casts later I got into a second largemouth, this one a bit smaller. I was pretty happy to have figured out the key to catching fish here. Now, do you remember the snag I was telling you about earlier? Well I fell victim to that snag and I lost the only all black beaded wooley bugger I had. I looked in my box and I tied on a beaded thin mint but no takers. Then I tied on a black streamer and still no takers. I had a black wooley with red flakes in it and I figured that was the closest thing but unfortunately they showed no interest in that either. After a while I called it a day and added a mental note to pick up a few beaded black wooleybuggers for my next trip out there. As it turns out, I didn’t have to go all the way to Camanche to catch a bass on the fly, I did it 20 minutes from my door step. With this day I completed one of my 2014 goals, to catch a largemouth AND a smallmouth on the fly! Now its time to catch some larger buckets and smallies. I look forward to that feat! Interesting how Putah Creek changes as it runs down into the valley. It definitely is! further down it has striper and largemouths in it! Hi Juan. No offense intended, but if you think you've got it figured out you're going to be fooled. From what it sounds like, perhaps you weren't getting down deep enough to get any interest from the big ones lying low. I would also recommend, if don't do it already, that when you first get there, make sure to turn over a few rocks to see what nymph cases are there. It will help when fly fishing but probably not much spinning. Good luck on your quest. Thanks for raining on my parade there, howard! lol In no way did i think I had the creek COMPLETELY figured out but that I figured out how to catch some bass during this time of the year in that spot only. I do need to figure out the rest of the creek and what the bigger guys will bite. Juan, I can tell that you are becoming more persistent with your fly fishing efforts and that persistence is beginning to pay off. Learning different waters, fly patterns, and habits of feeding fish from one place to another is what a fly fishing life time is made of. I am trying my best mel! I'm forcing myself to take fishing trips with only my fly rod in hand. 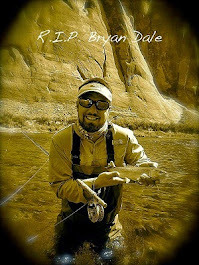 I hadn't checked in with you in a while... but congrats on the Smallmouth on the fly rod. Woo hoo! Thanks, brother! I appreciate it!